Salem, N.Y., June 3, 2004 – A newly designed Web site for National Elevator Industry, Inc (NEII) invites NEII members, the riding public and the press to access new, in-depth building transportation information, as well as easier-to-use communication tools. With NEII’s renewed focus on codes, safety and education, several new features make www.neii.org the ultimate information resource for the building transportation industry. Specially designed areas are devoted to the riding public, existing and potential NEII members, as well as the media. First, the NEII newsroom provides access to press releases and the latest news and announcements. Additionally, the site offers a safety section containing a variety of step-by-step riding tips, information about employee issues and public safety. NEII’s Web site provides guidelines and information to regular members about the most recent American Society of Mechanical Engineers (ASME) safety codes and standards, accessibility standards and much more. 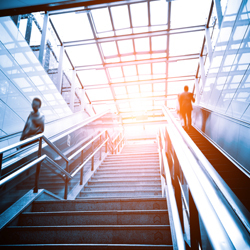 The public and members can access an interactive flash presentation about recent changes made to the ASME Safety Code for Elevators and Escalators, ASME A17.1, aimed to improve rider safety. The presentation was developed as a tool to educate the industry about compliance with the ASME A17.1, ADL-developed escalator step/skirt performance index and related code changes, and includes information on equipment upgrade options, such as skirt deflectors. To better serve its members, NEII has created a password-protected, private communication forum known as NEII Talk. Allowing for easier and more efficient communication among members, users can log into the program to post messages, upload files and view committee reports.